Joseph was born in Germany, according to his census records. Church documents show his birth year as 1780, though the 1850 census lists his age as 77. If that is accurate, he would have been born in 1773 (though the census number is difficult to read. Like his father, he was a tinner by trade, and lived in Emmitsburg, Maryland. How or why he got there is unknown, though it is not far from Conewego, an early Behe stop. An interesting side note: The Emmitsburg Road, the main artery through town, ends several miles to the north in Gettysburg, Pennsylvania. Across this road came Pickett’s Charge, the final and unsuccessful assault by the Confederate Army in this decisive battle of the Civil War. Behes fought in this famous battle. Joseph’s last name was spelled variously as Beaky, Beakey, and Beachey. How do we know he was the child of Emanuel? In the Cambria County Courthouse records there is a Bill Of Sale agreement between Emanuel and his children, where Joseph is listed. A second land sale record between Emanuel and Joseph lists his residence as Emmitsburg. 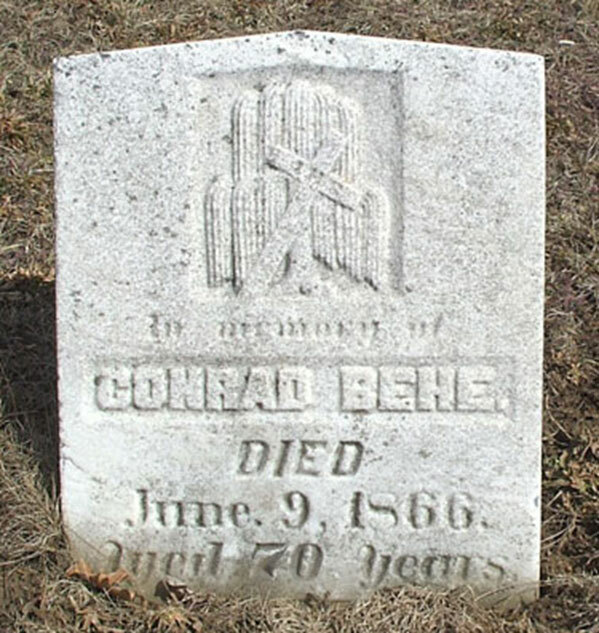 Maryland was a slave state, and Joseph the only Behe known to have been a slaveholder. Documents show he owned and sold a slave girl, Matilda. Joseph’s name is listed several times in Helman’s History of Emmitsburg. Among his (and Emanuel’s) descendents are Presidents George H. and George W. Bush. This appears in the Americans of Gentle Birth book, cited earlier. The name of Emanuel is badly mangled, but the lineage appears to be accurate. Most ancestry accounts of the Bushes do in fact link back to Joseph. Joseph and Catherine are buried next to one another at St. Joseph’s Church cemetery in Emmitsburg. 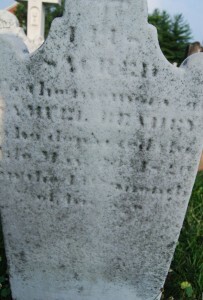 The gravestones are badly deteriorated. They had two sons who were both named Samuel. One died at 13 months, the other evidently named after him. Both are buried next to Joseph and Catherine. There were 13 children in all. As noted the first son, John, appears to have lived in Loretto for a time. The second son, Joseph, was the Bush ancestor, and his lineage can be traced in Bush ancestor accounts. I have no further information on descendents of the other children. Susannah was also born in 1780, though it is not known if she was the twin of Joseph or possibly the first born child. Census records show her place of birth as Germany, specifically the state of Baden. She would have been approximately 10 years old when they made the crossing from Europe. By 1802 she was married to Englebert Walters and living in Loretto with their first child, Daniel. I have not found a record of her date of marriage. 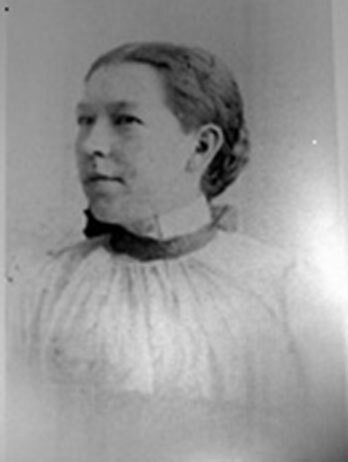 The Walters clan consisted of ten children, and were prominent members of the Loretto community. Two of the children were still alive in 1899 and took part in the Loretto centenary celebration. The following is from the Souvenir of Loretto Centenary book. The two old ladies seen in the above picture are sisters, daughters of Englebert Walters and Susan Behe, who were among the pioneers of this district. Mrs. Cooper was born March 10, 1810, and Mrs. McConnell, February 21, 1812. 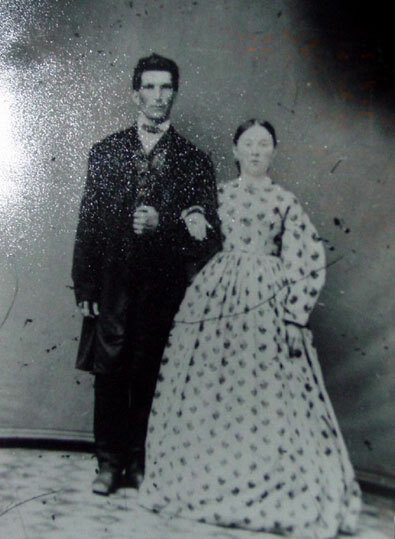 They were both baptized by Father Gallitzin, and were married by him on the same day, — April 28, 1835, — the former to Joseph Cooper, the latter to Hugh McConnell, who was reared in the prince-priest’s house, and whose wife also lived for a time with Father Gallitzin. They are residing on the same farms to which they were taken after their marriage, — the former near Loretto, the latter near Chest Springs. Despite their advanced age they are still remarkably active, and surrounded by their numerous descendants they are peacefully biding their time. 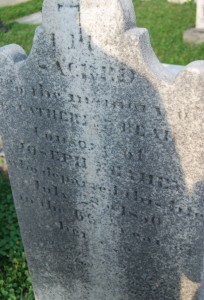 Susannah passed away in 1850 at the age of 70, and is buried in St. Michael’s cemetery in Loretto. Anthony was born in Germany, and was a very young child when the family came to America. He became a farmer in Munster Township. In 1813 he married Mary Noel, and they had three daughters; Mary, Elizabeth, and Veronica. I have seen family histories that show the Noel family as also being from Alsace. The family were active members of St. Michaels Parish and appear in church records. Elizabeth married George Kearns, and Veronica married Garrett Risban. These surnames still appear in the area. Anthony last appears in the census of 1870 at the age of 82. He lists his birthplace as Bavaria. 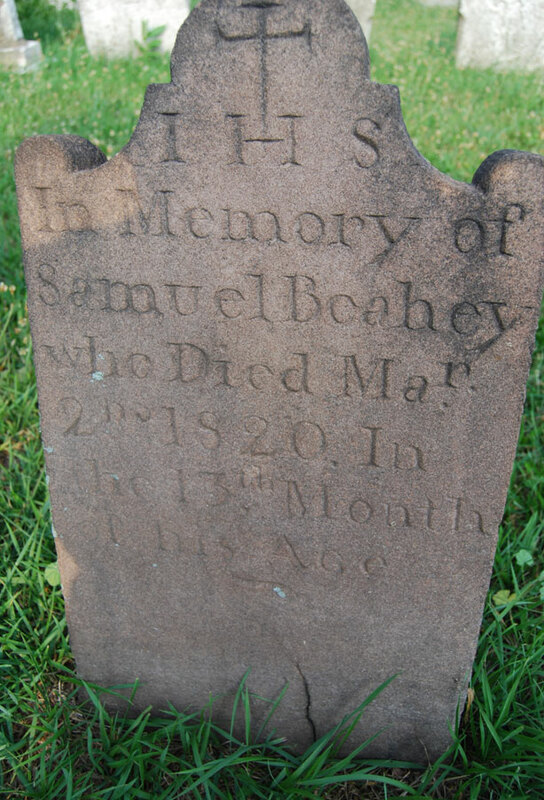 Mathias was born in on May 4, 1790, the first Behe born in America. In census records he lists his birthplace variously as Maryland and Pennsylvania. Like his brothers, he was a farmer. 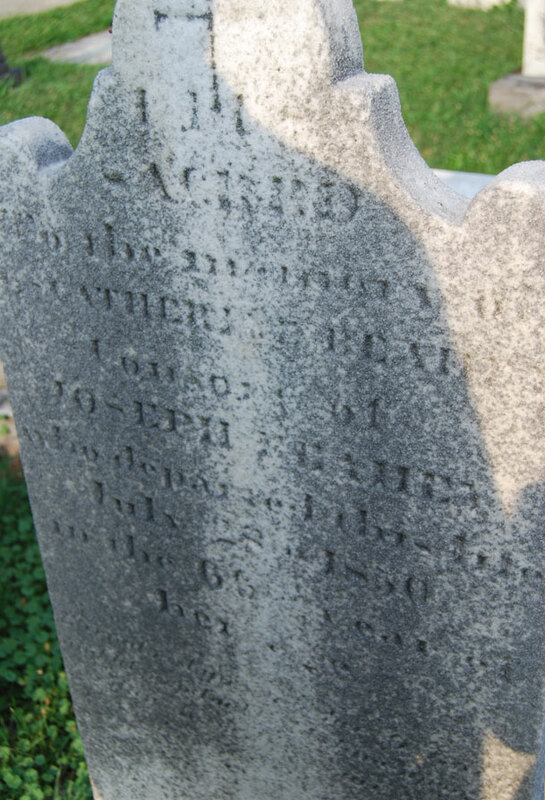 In 1818 he married Catherine Kaylor at St. Michaels. They had a large family of ten children. 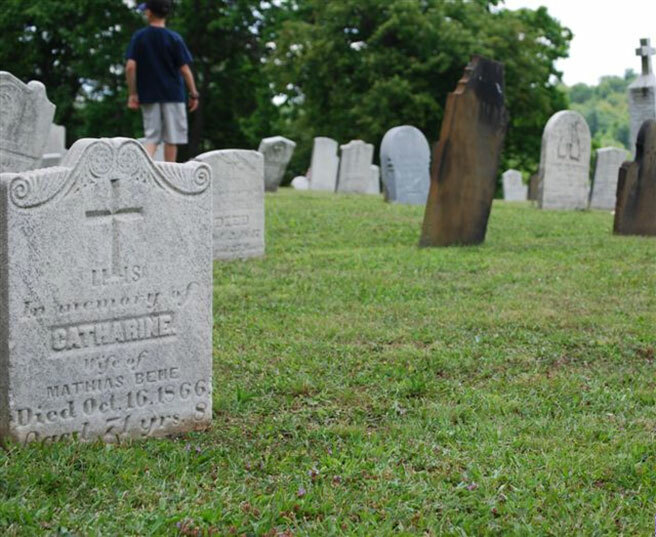 Catherine died in 1866, while Mathias reached the age of 92 before passing away in 1882. They are buried in St. Michael’s cemetery. The grave of Mathias can no longer be found. 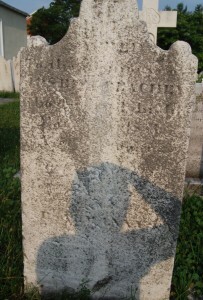 It is believed that the headstone was in disrepair and was thrown away with others in likewise poor condition. Below are old photos of the graves. It appears from looking at the background that they were side by side, and the plot next to Catherine is currently empty (see photo taken in 2008). Conrad was the youngest son, born in 1796. Conrad was a farmer in Washington Township. He married Elizabeth Noel, who was the sister of Mary (wife of Anthony Behe). Of this union were born eleven children, the first of them, Conrad Jr., dying in infancy. The family were active members of St. Michaels, their names appearing in various church records. 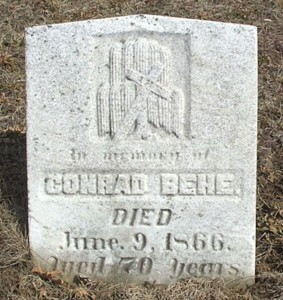 Many of Conrad’s descendents settled in and near Lilly, Pa. Conrad Behe passed away in 1866 at the age of 70, and is buried in St. Michaels cemetery. 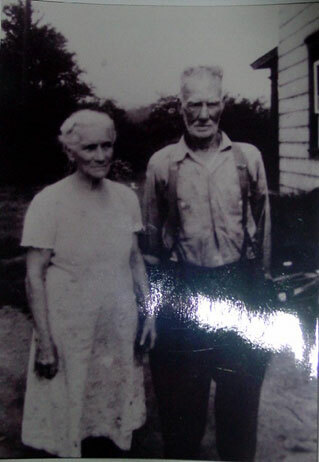 The photo below is of Joseph Conrad Behe and his wife Sarah (Maxwell) Behe. Joseph was the son of Conrad and Elizabeth, and a Civil War veteran. Below on the left is Anna Rachel Behe, on the right Bertha Behe and Martin Myers. Both were daughters of Joseph and Sarah Behe. These two are listed as Emanuel’s daughters in his Bill of Sale document in the Cambria County Courthouse. I’ve been unable to find other references to them, and they remain a mystery. They may have been born in Europe, as there are gaps in years between Emanuel’s early children.